Okotoks is a charming community also has the advantage of being surrounded by magnificent mountain views, bountiful rolling hills and the splendid Sheep River Valley. The close proximity to urban centres, transportation corridors, & the US border. Okotoks is located 18 kms (15 minutes) to the south of the Calgary city limits, only 5 minutes from Highway 2 and the Deerfoot Trail extension, and 20 minutes from the recently completed Stoney Trail. This location provides home owners with superior access to commercial and industrial business for jobs and shopping. 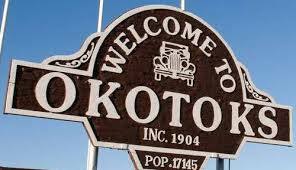 Okotoks is the largest trading centre or community between Lethbridge and Calgary.